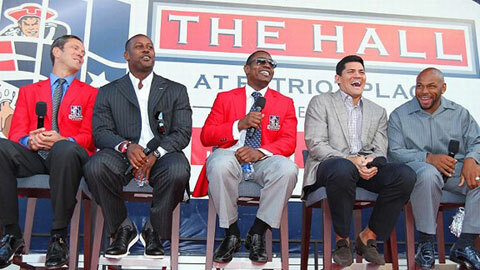 The Patriots announced the nominees for the team's Hall of Fame today, and the names should be very familiar. Cornerback Raymond Clayborn is back on the ballot after not getting voted in last year. Clayborn, a three-time Pro Bowler, was the 16th pick in the 1977 NFL Draft and played in New England for 13 seasons. Linebacker Mike Vrabel, who was part of the Patriots' first three Super Bowl championship teams who chipped in on offense in key spots, aka Super Bowls XXVII and XXXIX. Vrabel is considered one of the best free agent signings in team history, playing for New England from 2001-2008. He was traded to Kansas City along with Matt Cassell for the draft pick that would become Patrick Chung. Defensive end Richard Seymour rounds out the ballot. Like Vrabel, Seymour was also a part of New England's first three championship teams and was easily the third-best player on pretty much all those teams besides Tom Brady and Ty Law. He was named to the Patriots' 50th anniversary team in 2009 and his five Pro Bowl selections are the most by any New England defensive lineman since the AFL-NFL merger. Who do you think should be voted in? Let us know in the comments below.